I went walking with my husband Jeff and Millie (my Yorkie) at the park over the weekend and saw and definitely heard nothing but American Robins. You know the bird with the blackish brown head and wings and the orange breast. It is probably the most familiar bird to many people. They were everywhere! In the holly bushes mostly eating berries, but also hopping around on the ground looking for worms. The temperature was around 35 degrees and it was sunny.. A good time for robins to be out and about don’t you think? Or is it? Are American Robins supposed to be here in the winter months when it can get down into the single digits in temperature? Don’t they migrate south only to return late March or early April to announce that spring is here? Well that is what most people think anyway. But in actuality a lot of robins never leave or at least do not travel too far unless there is a scarcity of food. Some will stay put and stick out the cold North American winters and will hide in trees and shrubs to stay warm. With their thick down feathers they can hold in body heat and to maintain that body heat they shiver. Of course they have to have the energy to do this and that comes from the food that they eat. Where are Are American Robins Found? The American Robin is found throughout the United States, Canada and Europe. You may spot them most anywhere maybe foraging for their food on the ground. Look around woodlands, gardens, orchards, lawns, and in fields. Their trademark: They run and pause on open lawns/dirt, looking or listening for worms to grab to eat. 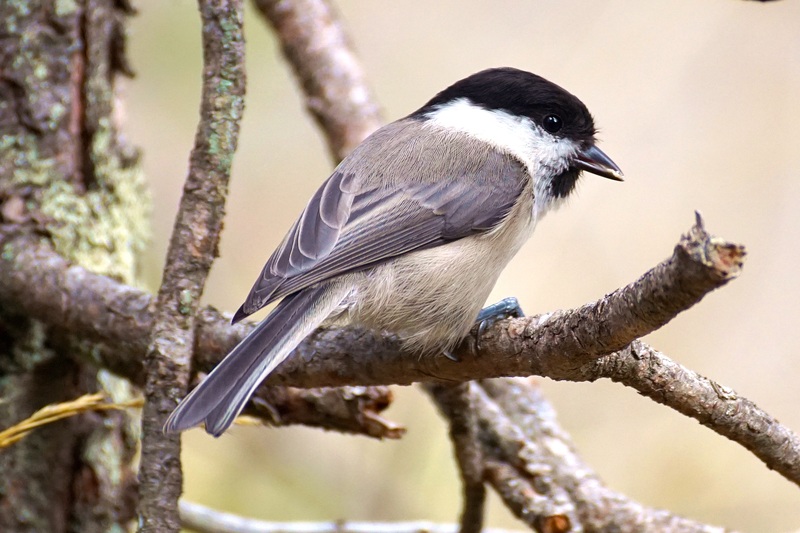 Their song can be heard in the early morning hours and also late at night. 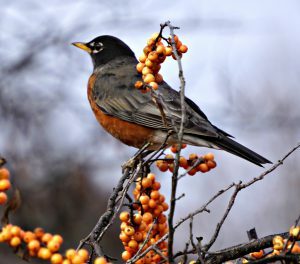 Robins eat the berries from many types of bushes and trees such as the Winter Holly, Crabapple, Chokeberry, Hawthorn, Bittersweet, and Hackberry. Of course you can feed them yourself using a platform feeder or suet feeder that has fruit included in the mix. Raisins, cranberries, apples, pears, oranges, blueberries, and currants are all good food for robins. Something else to think about if you want to keep them coming back to your yard is to have a birdbath set out. 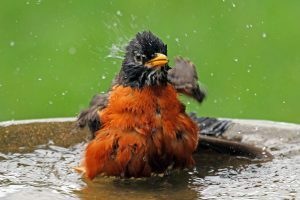 This is so that they can obtain drinking water and also to be able to bathe for cleaning and maintaining their feathers. All birds need this year round not just during the summer. You can use a heated birdbath in winter. There are the kind that is part of the bath itself or you can get a heater to place in a birdbath that you already have. Males scope out the nesting grounds before females come along. The female will do most of the nest building with some help from the male. Nests can be anywhere from five to twenty five feet off of the ground. You probably have seen a robin’s nest anywhere from on top of a porch light, to a house ledge, or just inside a low growing tree or shrub. I have even had one wedged in between the basketball hoop and backboard at our old house. Both parents feed their young. At about fourteen to sixteen days the young are able to leave the nest but will still be taken care of by their parents a while longer. The parents will continue to feed and protect the chicks until they are able to forage on their own. Juvenile robins and their eggs are preyed upon by jays, squirrels, grackles, crows, and snakes. The adults are more tasty for hawks, cats, and snakes. It is not unusual for American Robins to be hanging around during the cold winter months. It is just that most people do not notice them because they themselves remain indoors and miss robins in their own backyard. Robins are feeding in the trees on berries, eating fruits from birdfeeders, and even looking for earthworms if the ground isn’t frozen. I have seen them in low temperatures at about twenty degrees, out in the sun doing their running and stopping behavior searching for earthworms. If they are not doing that they are hiding in the trees and shrubs from the weather keeping warm with their down feathers. Come late February, early March, robins can be seen in numbers feeding on the ground every where you look. It is then that people start to come out of their warm houses and realize that they are present. Springtime! Have you had any American Robins hanging around your backyard this winter? If you live in North America you probably do especially if you have berry bushes or feeders that contain fruit in them. What are your thoughts and/or experiences with American Robins? I would love to hear from you. Please make your comments below.